There are many baby footprint kits and baby handprint kits on the market, and at www.babyfootprints.info we have a goal of testing as many as possible. Please check back to see what footprint and handprint kids we test next, and if you’d like to weigh in on kits you’ve tried or would like to see tested, please e-mail footprinter@babyfootprints.info. I was really pleased with the baby footprint and handprint kit produced by Sculpey, the company that makes Sculpey clay. The main downfall of plaster baby footprint kits is that they are less forgiving when it comes to timing and the literal mis-steps that come with trying to get a baby to put a hand or foot where you want it when you want it. With clay, this is not an issue. 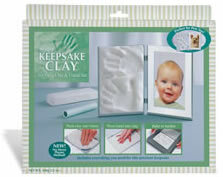 The Sculpey baby footprint kit comes with a fair amount of white polymer clay (kits also come in pink and blue) as well as a roller to spread and smooth it into the frame. I liked knowing that if I “messed up” on either the handprints or scratching in the date, I could just roll it out again and start over. The whole process took less than 20 minutes. Alec was eight months old when we did this project and I was able to fit both his handprints, staggered, in the frame. With a newborn, I think it would be easy to fit two baby footprints or two handprints. With a child much older than a year, I think you’d have to go with just one hand. I was a little worried that the clay would shrink as it cooked, crack or otherwise lose its shape or integrity. That didn’t happen. In fact, it’s been two years since we did this project and it’s holding up great. I also liked being able to add a picture to the other half of the frame. It will fit a 5-by-7 photo or a matted 4-by-6 photo. The Sculpey kit retails at $9.99 and up but I used a 40-percent off coupon at a chain craft retailer to purchase ours. I was less pleased with the Newborn Impressions Kit made by Plaid, a popular crafting company. This baby footprint and handprint kit involves plaster, and despite following the detailed instructions carefully, we didn’t end up with a useable handprint impression. Again, the instructions are clear and complete: You rinse the mold tray, add warm water to the bag of plaster, shake it and pour it into the mold. Then you tap out any air bubbles and wait three to five minutes before testing the plaster with a finger to see if it’s began to set. Ours was still very watery, so I checked every 2-3 minutes as suggested. Finally, I pressed my baby’s hand into the plaster for the recommended five seconds. But the plaster was still too wet. I tried to smooth it out to try again, but it had already began to harden too much. I ended up letting the plaster dry all the way (1 to 1 1/2 hours) and planned on using the molded plaster as a base for making handprints with paint (Plaid mentions this as an alternative project), but we’ve never gotten around to it. On the up side, the kit was affordable and comes complete with a set of paints as well as molds for several baby-themed shapes. The company’s suggested retail price is $13.64, but this kit is often found at national chain retailers who offer discount coupons. 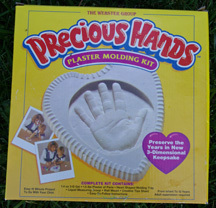 I bought this child handprint plaster molding kit by The Webster Group at a chain retail store and gave it to my mom, thinking it would be a cool activity for her to do with my 3-year-old son. They did have fun, but she reported that the kit was hard to use. The plaster dried too quickly and the instructions weren’t incredibly clear. In fact, my kid’s 3D hand didn’t look anything like the example on the box, because it was done upside-down! I’m still not sure how that happened. He did have fun painting it, though.